Introducing the Überleben Kessel. The last camp kettle you'll ever need. ✔ THE PERFECT TRAVEL COMPANION: Take the Kessel with you wherever you go. It's lightweight for its kind and perfect for cooking around the campfire, camping, backpacking, hiking, emergency survival, and bushcraft. ✔ EASY COOKING AND POURING: The Kessel was made for two things: cooking and drinking. 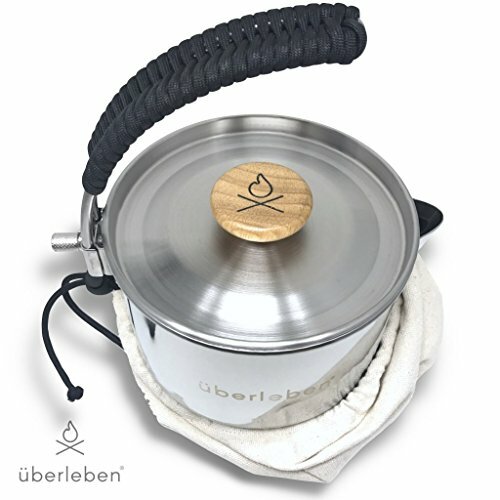 The heat resistant stainless steel makes it easy to warm anything up over a fire, while the strainer spout allows for easy pouring of your favorite soups and drinks. ✔ FOLDING HANDLE FOR EASY STORE AWAY: The fold-down locking hangar handle wrapped in 6.5 feet of mil-spec 550 paracord makes the Kessel easy to pack with you on adventures. ✔ STAINLESS STEEL FOR FAST CLEANING: The Kessel is made of durable 304 Grade HD Stainless Steel. Its polished exterior and natural hardwood handle were designed for easier wipe downs. ✔ INCLUDES STOW POUCH: The Kessel includes an unwaxed drawstring canvas stowaway pouch. It also doubles as a tinder pouch when you need to build fires.